Freedom and hope are part of my DNA. And though I don’t run around wearing hippie skirts and peace necklaces, I have come to realize that freedom and hope both represent for me something far beyond their prevailing interpretation. They are fundamental elements of our being; and as they are, thankfully, commonplace around these parts, most of us probably just take them for granted. Appreciating that it is our need for freedom which holds many of us back from taking risks, making commitments, building connections and meeting expectations is an important step toward self-improvement. In my case, it was this understanding which allowed me to resolve this conflict and thus preserve my dream. 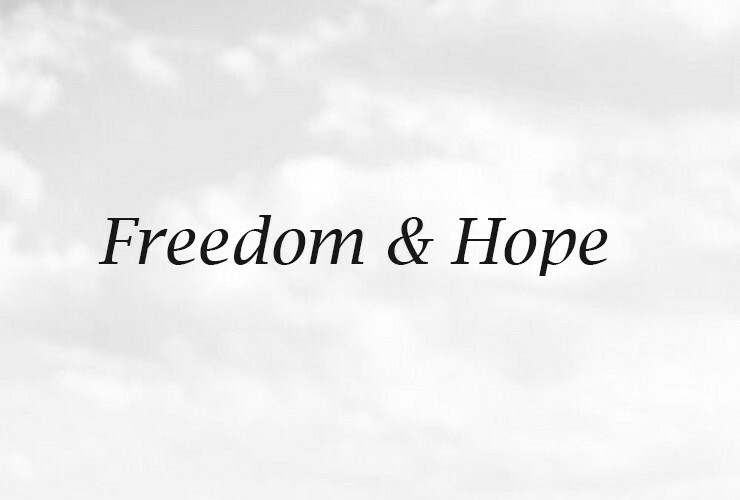 Freedom and hope are counterparts or two sides of the same coin. Hope provides the freedom from having to face the truth; and even if we agree with Friedrich Nietzsche's "Hope in reality is the worst of all evils because it prolongs the torments of man," it is a disposition or a torment which I am not willing to surrender. We arrive in the world free of rules, social obligations, expectations or manifestations. We quickly grow to understand that this is a very deceptive freedom, as we adjust to all the laws and limitations imposed on us by parents, society, morality, governance, faith, and more. As we mature, as teenagers and certainly as adults, we are forced to obey many rules while simultaneously accruing more responsibilities as students, employees, spouses and parents. And although I am a conformist in many ways and find myself at peace with frameworks such as family, school, organizations and the general state of affairs, even I came to recognize my limitations. I wasn’t aware of how significant freedom was to me until I started drowning under the weight of self-imposed boundaries. It is our wish to please others that makes us lose our ability to satisfy ourselves. We think that by preserving our own island of privacy we can somewhat mitigate the influence of so many restraints. But that is far from being enough. From years of experience, I now understand that the real meaning of freedom reaches far and beyond its physical and spiritual implications. Looking back over my career, trying to identify what it was about some positions that made me happier than others, I think I can pinpoint the governing factors. A day job that leaves no freedom for independent thinking, actions or creativity, regardless of how senior, influential or prestigious it may be, is wrong for me. Likewise, a job that offers no hope, no far reaching enthusiasm or expectations, a job which focuses only on the "here and now" is not for me. Freedom that allows unfettered and open thinking; creative thinking in other words. When it comes to independent thinking, if my thoughts and actions are tied to unrelenting rules or instructions, I cannot focus or bring out the best of me or even any of me. This realization sank in very slowly during the early days of my working life when I kept feeling frustrated and miserable, uncertain of what was wrong. It wasn’t my relatively junior position that was to blame. Looking at my superiors I could see no one who to look up to and emulate. Even once I had achieved a position which provided the respect and financial security I had long coveted it still didn’t feel right. Freedom to be independent in thought and action. From personal experience I have seen the devastating implications over-management has on my capacity to think and perform, leaving me with neither. I was like a puppet on a string. My mind literally froze and I was left with so much self-doubt that it took me years to regain my self-assurance. It proved to me that micromanagement, at its best, or any kind of over-management can have counterproductive results. Freedom to be my own self. To be free to act according to my instincts and passions, to be natural and to spend time doing what I like most and in the way I like doing it. 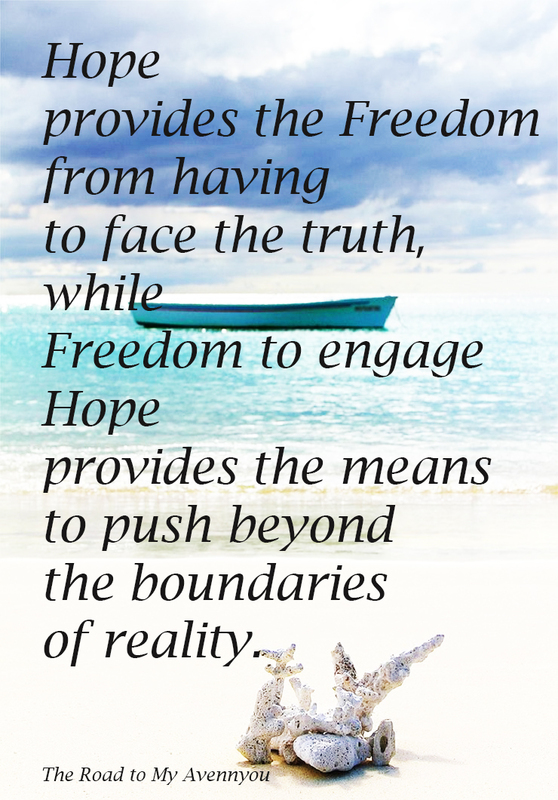 Freedom to engage hope as a means to push beyond the boundaries of reality; hope meaning the light at the end of the tunnel, however, and not hope in the shape of "illusion." Hope can take the shape of optimists who face the truth but still find the strength to act for change and a better future. Hope is the spark that lives within us waiting for its moment to shine. Hope is the drive for advancement, it is the tool for pursuing dreams, it is the power behind the determination to make the impossible possible. So, yes, it may also distract us from looking truth in the eyes, but when reality is constantly being shaped and created around us by endless forces, it raises the question of what truth really is. And so, as much as I appreciate my previous criteria for choosing the perfect job—financial security, ability to make use of experience and skills, a suitable environment, a supportive corporate culture, benefits, and future advancement—they have become nothing more than nice trimmings. They may direct me to potential satisfaction but can just as easily be found hollow if missing the master ingredients: freedom and hope. This awareness should also be my guide when evaluating risks related to career planning. As difficult as it is to jump into new waters with so many unknown variables, knowing it is for the best cause possible should resolve any indecision. And so, "financial security" should be replaced by "risk taking," "supportive culture" exchanged with "inner drive and motivation," "benefits" should lie comfortably with "self-fulfillment." No, we cannot pay the bills with these, but we can take a chance, at least for a while, knowing we gave it our best shot. I will probably keep on searching until I reach that place where I can integrate these two fundamentals—freedom and hope— into my day to day. Only then will I feel satisfied, contented and self-actualized. And as long as I am on my way to that place, it gives me hope; hope for getting closer to my goals, hope as a catalyst for happiness. 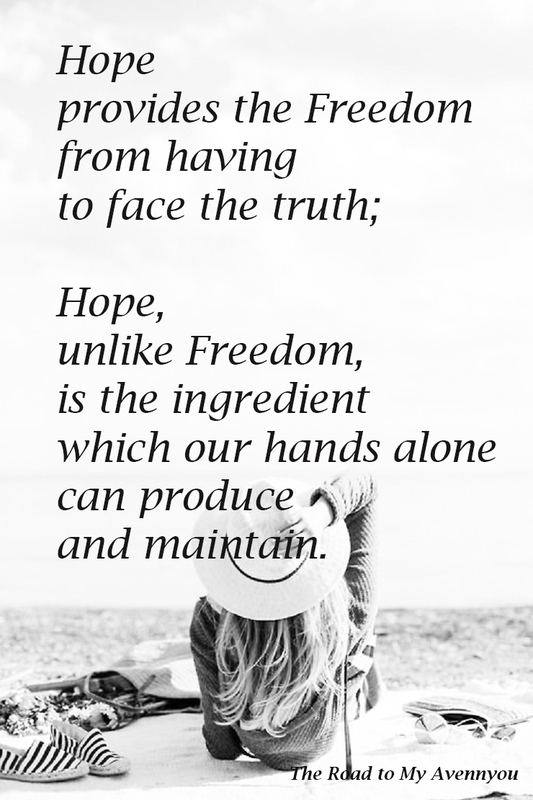 And hope, unlike freedom, is the ingredient which our hands alone can produce and maintain. Like cultivating an optimistic view on life, we may lose it occasionally but we can also find the power and strength to restock.